Stratospheric talent and charisma – but is he authentic?! In the latest iteration of multiculturalism as salad rather than melting pot, there has been constant discussion in social media about authenticity and representation. A recurring topic is whether roles should be assigned to actors who match the race (however defined) and even ethnicity of the characters. Several threads make up this tangled knot: the poor representation and lack of opportunities for non-defaults in media and just about everywhere else; the industry’s stated need for face recognition (and hence bankability) of the principals; the conspicuous whitewashing of several signature works upon translation to the screen, Le Guin’s Earthsea among them; the hooha over whether there can be gender slippage in roles that “should be” cast in stone (Helen Mirren as Prospero in The Tempest); the stereotyping and category-lumping by physical appearance (tall and fair – Elf; short and dark – Orc or Southron; tall and dark – Uruk Hai; and poor Cliff Curtis keeps getting cast as an Arab or Latin American despite his long Maori lineage). Over this hovers the flammable balloon of xenophobia which grows heavy during times of economic dislocations and tends to burst in bouts of “cleansing” whether that comes via restrictive immigration policies or outright slaughter. A “swarthy” woman with a petrified legacy accent myself, often pigeonholed on sight as Indian, Latin American or Arab except for the swagger, I’ve had customs and immigration employees yell “Speaka English? Huh?” an inch from my face. My name has been mangled throughout my adult life, I’ve suffered through “interpretations” of my mythology and history that would make cavemen cringe, and I strongly suspect that my grant, book and story proposals might have met different fates if I had submitted them under a more generic (or, ironically, more exotic) pseudonym. At the same time, as I wrote in Caesars and Caesar Salads, the demand for total verisimilitude can be as parochial as its opposite. For one, race definitions vary significantly by culture and the current tendency of justice warriors to call anyone who’s not Anglo and blond “a person of color” hovers perilously close to definitions of traditional bigots. Also, some people identify with more than a single demographic slice, although most people of widely separate ancestries tend to choose one of their strands and cleave to it tenaciously. Finally, actors are meant to pretend to be someone else by definition. So it should be possible, with sufficient talent and training, to embody a persona beyond the narrow box of completely shared experience (ditto for writing, hobbled by the “Write what you know!” Hack101 exhortation). Isídhoros Bélas would be proud of his great-grandson. Which brings us to the latest complaint during this tense moment in US history when the culture wars are raging with no resolution in sight – namely, that Welsh-born Catherine Zeta-Jones has been chosen to play the Colombian narcotrafficanta pioneer Griselda Blanco. Zeta-Jones has the right allure and fame, plus she already played an equivalent role in Traffic. But, say the purists, she’s not Latina. And it’s an undisputable fact that there are plenty of Latina thespians, famous ones at that, who could embody Blanco. At that point, it occurred to me that I haven’t yet seen a single film or TV show about Greece or Greeks (whether myth or history, ancient or contemporary) produced outside Greece that uses even secondaries who are Greek – let alone protagonists. However, I haven’t heard a single voice raised in protest over Sam Worthington (groan) as Perséus, Brad Pitt as Ahilléus, Gerard Butler as Leonídhas, Colin Farrell as Aléxandhros… though I can live with Angelina Jolie as Olympiás and Ralph Fiennes as Ploúton. Some will argue that, well, Greeks are white. Except of course when we’re not, to fit a different agenda (an SFF darling recently stated on Twitter that “Plato was not white”, making me wonder if he’ll say the same when the topic of The Suffocating Influence of Dead White Males comes up). Or maybe our privilege is that we, too, are Europeans… except when we’re not (the Euro Northerners, whether in 1941 or 2008, seem to agree on this). Or that we, too, have had a colonial past… except ours, such as it was, ended way before that of the Mughals, Ottomans and Russians, let alone the more customarily excoriated oppressors. Or that the “Greco-Roman” legacy is one of the foundations of Western civilization… except that what Western Europeans call the “Greco” part of this chimera is as authentic as Burton’s retelling of Shahrazad’s stories. 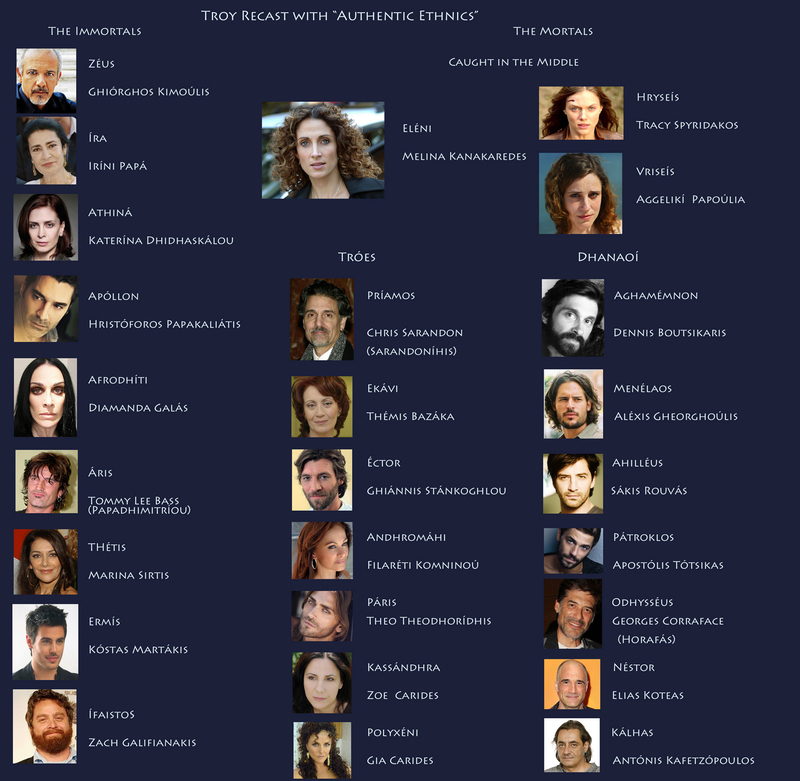 So as a tiny corrective, I did a recasting of Troy with Greek or Greek-descent actors. 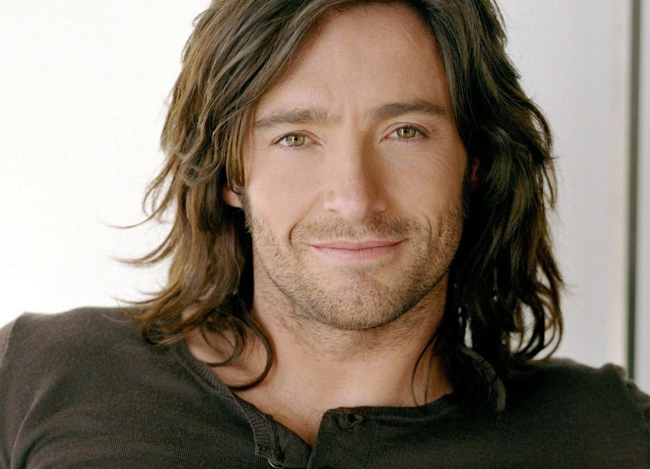 While checking out faces that could launch or stop a thousand ships, I discovered that Hugh Jackman, of Wolverine fame and nova-bright charisma, has enough Greek in him to be a card-carrying enrollee with nary a hitch (1/8, for those burning to know). The paternal side of his family once bore the surname Bélas. I was sorely tempted to cast him as Éctor, but decided on less-lionized faces. So below is my “authentic” Troy cast, with the non-diaspora names phonetically as close to correct as I can get them (click once or twice to embiggen accordingly). All are well-known in my country but, like its real mythology, history and literature, unknown beyond it except for Cliff-note versions. And Ain’t I a Human? 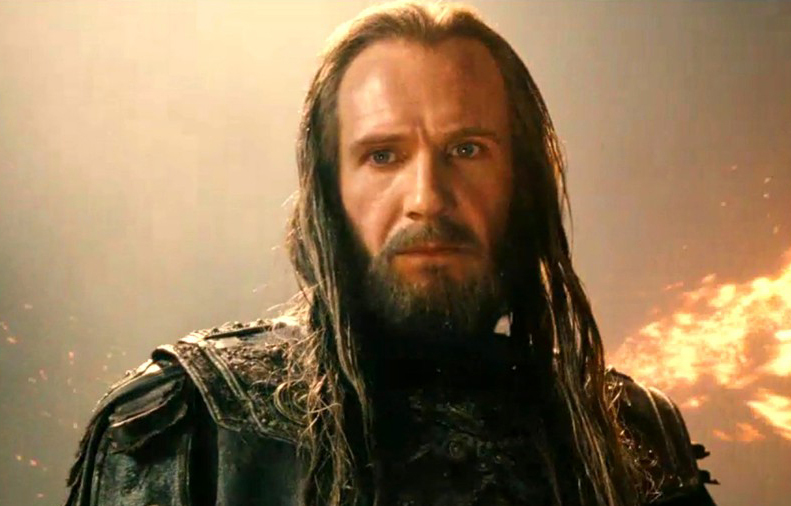 Images: 1st, Ralph Fiennes as Hades (Ploúton) in Clash of the Titans; 2nd, Hugh Jackman; 3rd, my idiosyncratic (and tribal) recasting of Troy. This entry was posted on Saturday, October 4th, 2014 at 1:00 am	and is filed under Art, Biology & Culture, History, Science Fiction & Fantasy. You can follow any responses to this entry through the RSS 2.0 feed. Both comments and pings are currently closed. The Iliad has gods. Troy was a crappy cartoon; so was Clash of the Titans… and 300… and… I’m glad you like the casting, Paul! In my recent reading of Walter Kaufmann’s Tragedy and Philosophy I was struck by his insistence that the matter of fact tone about the gods in The Iliad stemmed from a basically rationalist world view. References to a god doing this or that were more or less placeholders for chance or unknown causes or fate. That struck me as the sort of thing that philosophers do when they interpret, a process like lawyers citing history. How does the notion strike you? When I’ve read translations of The Iliad I rather tend to immediately think references to fair skin meant the poet was telling us the character didn’t live out in the sun and elements all the time, that they were privileged to have a pleasant and comfortable indoors. As a result, they didn’t have leathery tanned skin. But is that really stretching? On an unserious note, I’m not certain that putting 300 into the same category as Troy or Clash of the Titans (either version!) doesn’t tend to make 300 look good. I thought there is a strong case for assigning 300 to one of the outer circles of hell rather than (just) Hollywood. Gods in the old polytheistic religion of Greece were indeed the placeholders you describe. At the same time, they were close: they could be the person who shared your food in a tavern. Also, unlike the monotheistic monoliths, pagan gods were as fallible (and as vulnerable, except for immortality) as humans. So the interaction was matter-of-fact on all levels. It’s very likely that “fair” meant “not having to work in the fields” (this was the case until the industrial revolution, when tanned skin became a sign of being rich and leisured enough to spend time in the sun rather than in a windowless factory). Additionally, “fair” may have been a code term to designate the nobility as Mycenaean, a layer superimposed on the older inhabitants whom Greek-speakers encountered when they came to that part of the world. Sort of like Normans and Saxons in England. I’m with you about 300. It deserves a hell circle all to itself. Fascinated by the different faces–how did you decide which one would be Hector and which one would be Paris, for instance–did they match an internal template, or was it a matter of more-or-less right? When I look at your Menelaus and your Paris, I can definitely see that Helen has a type she likes (or a type she attracts?) I like your Odysseus very much. Yes, the Odysseus embodiment is one of my personal favorites. You ask a very interesting question about how I chose them. I did it the same way I visualize the characters in my fiction: I hear them speak; when I find a face that feels to me as corresponding to the voice I have been hearing (and by voice I mean more than just the talk), that’s the one I choose. Oh, I groaned about Sam Worthington. Indeed, I did. American Marine-looking white boy playing Perseus and who somehow had access to a modern razor? Argh! Crew cut, too! For one, short hair in that culture denoted slavery (I discuss this in Being Part of Everyone’s Furniture). Good point! So much wrong with his casting, etc. The main issues with Clash of the Titans (as is the case with most of these) are that 1. Worthington has the talent and charisma of a particle board plank and 2. these stories are intrinsically interesting — but Hollywood makes them boring. Yep. And in the remake they cut the women’s roles to nothing. At least the original had Maggie Smith. Of all the ancient epics I do not care for, 300 tops my list. The worst part is the makers admitted they used it as pro-American propaganda against the Middle East. I really like this casting – and I agree, on 300. As for Clash of the Titans (like its sequel), it could almost be comedy if it wasn’t so groan-inducing. I’m glad you like it, dear Heather! The Iliad, in many ways, is the story of relationships — not just warriors clashing on a darkling plain. I cast with an eye to that point. I like your casting- though I have not seen the 2004 Troy film and thus cannot compare this with the actual cast. I especially like your Odhysséus! I hated the Clash of the Titans remake… oh, and 300, could not even finish it. Even if I didn’t care that it mangles the story Leonídhas and his warriors, I am still wondering why there is a giant HOLE in the middle of the Spartan town square? Dear Christopher, I have read a couple of retellings of Shahrazad’s stories but since I don’t know Arabic I cannot tell how well they represent the originals. Ha ha, I understand, I don’t know Arabic either. Still, based on simple enjoyment, do you have any retellings you recommend, Athena? You know, most of my readings of these stories were in Greek! So that wouldn’t help either. Oh, yes, you are right- that doesn’t really help. Someday I want to learn Greek to read the classics but that doesn’t make sense for the 1001 Nights! Thanks all the same, I’ll be sure to check the library for some retellings other than Burton’s now.